A white nonmetallic, natural mineral identified chemically as calcium metasilicate, CaSiO3. It is the only commercially available pure white mineral that is wholly acicular (needle-like crystals). Wollastonite is available in fine particle size powders as well as fibrous 'high aspect ratio' products (20:1). This material has a very unusual texture, it does not flow at all (a hand full can be picked up with fingers downward). Wollastonite's unique qualities were first recognized in 1822 by an English scientist, Sir William Wollaston. However as a commercially available raw material wollastonite has only been available since the 1950s. Explosive market growth took place during the 1980s and 90s and major industrial sectors have adopted the material. Deposits are mined mainly in US, China, India, Mexico, Canada, and Finland. They vary in purity; some require almost no beneficiation; others may require removal of up to 80% impurities such as garnet, diopside, limestone, and dolomite (e.g. by magnetic separation, froth flotation, optical sorting). Synthetic wollastonite is also made by combining quicklime with quartz, calcium carbonate and calcium hydrate. No commercial products have the theoretical chemistry shown here. 325 mesh is used commonly in ceramics. The fibrous form of wollastonite can be very beneficial in bodies. In low fired ceramics wollastonite reduces drying and firing shrinkage and drying and firing warpage. It also promotes lower moisture and thermal expansion in the fired product and increases firing strength. It fires with no LOI and its fibers help vent out gassing. These factors have made it a valuable component in tile bodies, especially for fast fire. It is common to see 10% wollastonite in low fire earthenware recipes. Vitreous and semi vitreous bodies can also show reduced shrinkage with small additions (2-5%), however wollastonite becomes a stronger flux as temperatures go above 1100C. The SiO2 and CaO it contributes react more readily to form silicates, thus wollastonite is used as a major flux in high temperature sanitaryware, tile and electrical insulators (augmenting feldspar and silica, pushing their percentages down very significantly). Wollastonite exhibits a slight solubility in water, but slips containing it can become more alkaline (potentially affecting rheological properties). In casting bodies this can be a benefit, its gellation can decrease casting rates. 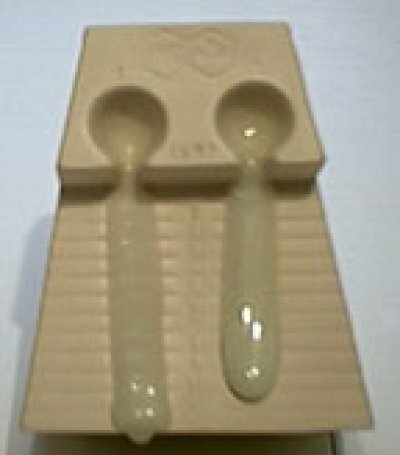 The powdered form has a tendency to form agglomerates during storage (which create lumps in glazes necessitating sieving). Manufacturers warn that stock should be rotated to prevent it getting to old, that it should be stored in dry conditions and that pallets should not be stacked more than two high. At higher temperatures the powdered form is valuable as a source of CaO flux in glazes (and bodies). The other main raw source of CaO is whiting but it releases a high volume of gases of decomposition which produce suspended micro-bubbles that demand slow firing to clear. Also, since wollastonite sources silica as well, glaze recipes employing it do not need as much raw silica powder, especially at lower temperatures (since the wollastonite is sourcing SiO2). Wollastonite's greater readiness to melt at higher temperatures has a curious side effect: Glazes can tolerate higher SiO2 (from the Wollastonite) and melt just as well or better. In glass and fiberglass making wollastonite melts more readily (lower energy costs) and microbubble generation is lower than limestone-sand mixes. Wollastonite has the ability to seed crystals (in glaze melts of sympathetic chemistry), and can be valuable to create special effects which depend on devitrification (crystallization during cooling). Since CaO tends to devitrify in high temperature slow cooled glazes wollastonite can be employed to make faster cooled lower CaO content ones exhibit the same effect. Wollastonite is also used in stain and frit formulations to supply CaO in a more easily melted form. Even though a powdered samples may appear quite similar to feel and the naked eye, pay attention to the amount of +325 material if you need to switch brands or suppliers. Wollastonite is an excellent demonstration of the fact that we must consider chemistry a relative science, one piece in the glaze puzzle. The mineralogy of materials is another important factor to consider. For example, the melting temperature of a frit or glass is predictable, but since raw minerals are most often crystalline, the bonds holding the molecular structure together are more complex. The melting temperature of minerals of similar or even identical chemistry, for example, can be vastly different. To demonstrate we took a reliable cone 6 calcium matte glaze (Wollastonite - 34.0, Ferro Frit 3134 - 21.0, Kaolin - 45.0) and used the above technique to calculate an equivalent recipe employing whiting to source the CaO. We fired the two glazes side-by-side on upright tiles and in a flow tester to cone 6 (picture shown below). You might expect these glazes to fire the same since they have the same chemistry. Not so. The wollastonite version runs much more on the flow tester. This is because the wollastonite melts at a lower temperature than whiting or is more easily dissolved in the melting frit glass. Also, the entrained bubble population is much higher in the whiting version (whiting has an LOI of 45%). Additionally the wollastonite version is a silky pleasant matte, the whiting version is glossy. The former more fluid melt gives the crystals much more freedom to grow during cooling. 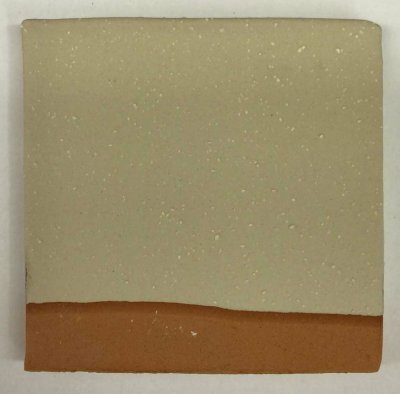 In simply looking at the glazed tiles one might easily assume that the transparent glossy whiting version is melting more than the matte wollastonite one, however the opposite is clearly the case. This is a good reminder that ceramic calculations need to be viewed in perspective. They excel in ongoing predictions of how changes to existing material amounts in a recipe will affect fired properties. They are much less reliable as absolute indicators of properties of unknown glazes. Always remember that glazes are made of materials that have a chemistry, mineralogy and physical properties and you cannot ignore any of these. Strangely, with the addition of magnesia and the right firing, wollastonite refractories of high porosity can be manufactured. 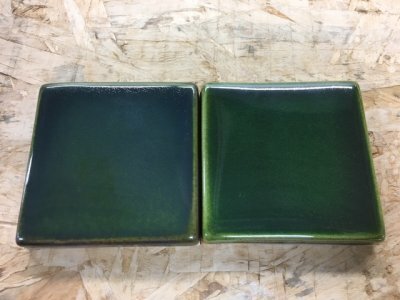 Two glazes, same chemistry, different materials. The glaze on the left is sourcing CaO from wollastonite, the one on the right from calcium carbonate. Thus the oxide chemistry of the two is the same but the recipe of materials sourcing that chemistry is different. The difference in this GLFL test for melt flow is an expression of how choosing different mineral sources to source an oxide can produce melting patterns that go outside what the chemistry suggests. The difference here is not extreme, but it can be much more. Glaze chemistry is relative, not absolute. It works best when you are changing material amounts, not material types. When you do introduce a very different mineral then you have a different system which has its own relative chemistry. 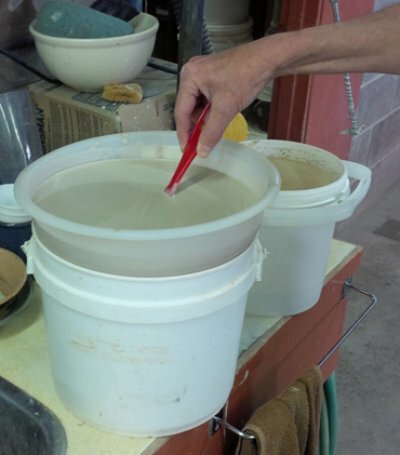 Screen a glaze to break down the wollastonite agglomerates (which often form in storage). This is an 80 mesh plastic sieve (the actual screen is a metal insert inside), I am using a spatula to encourage it to pass through the screen. If you do not do this, the small lumps you see on the freshly glazed piece will fire to surface bumps and ruin the glaze. The sample on the left is clouding up with entrained micro-bubbles and the surface is not a smooth. The solution was to source CaO from wollastonite instead of calcium carbonate and fire fast, very fast. That is what gas kilns do well!